La Sagrada Família (Catalan, ‘The Holy Family’) is a massive Roman Catholic basilica under construction in Barcelona, Catalonia, Spain. 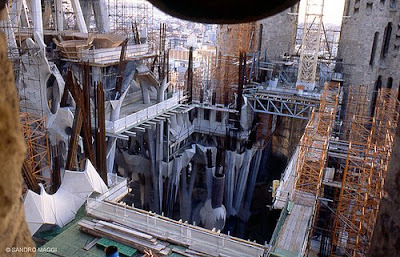 Construction began in 1882 and its formal title is Temple Expiatori de la Sagrada Família. Originally designed by Antoni Gaudí (1852 – 1926), who worked on the project for over 40 years, devoting the last 15 years of his life entirely to the endeavor, the project is scheduled to be completed in 2026. On the subject of the extremely long construction period, Gaudí is said to have remarked, “My client is not in a hurry.” After Gaudí’s death in 1926, work continued under the direction of Domènech Sugranyes until interrupted by the Spanish Civil War in 1936. 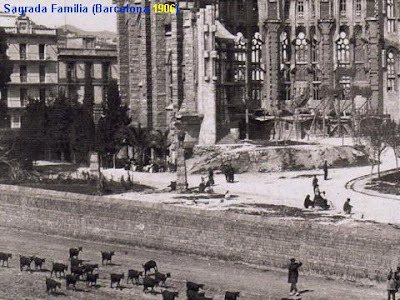 Parts of the unfinished building and Gaudí’s models and workshop were destroyed during the war by Catalan anarchists. The design, as now being constructed, is based both on reconstructed versions of the lost plans and on modern adaptations. Since 1940 the architects Francesc Quintana, Isidre Puig Boada, Lluís Bonet i Gari and Francesc Cardoner have carried on the work. The current director and son of Lluís Bonet, Jordi Bonet i Armengol, has been introducing computers into the design and construction process since the 1980s. Mark Burry of New Zealand serves as Executive Architect and Researcher. Sculptures by J. Busquets, Etsuro Sotoo and the controversial Josep Subirachs decorate the fantastical façades. According to the newspaper El Periódico de Catalunya, 2.26 million people visited the partially built basilica in 2004, making it one of the most popular attractions in Spain. The central nave vaulting was completed in 2000 and the main tasks since then have been the construction of the transept vaults and apse. Current work (2006) concentrates on the crossing and supporting structure for the main tower of Jesus Christ as well as the southern enclosure of the central nave which will become the Glory façade. Recently, the Ministry of Public Works of Spain (Ministerio de Fomento in Spanish), has projected the construction of a tunnel for the high speed train just under where the principal façade of the temple has to be built. Although the ministry states that the project poses no risk to the basilica, the engineers and architects of the temple disagree as there are no guarantees that the tunnel will not affect the stability of the building. A campaign is being waged by the Sagrada Familia preservation society (Patronat de la Sagrada Familia) and the neighbourhood association AVE pel Litoral.